Recipe Book is a real salvation for those who use the classic interface because now you do not have to remember recipes. It is very convenient and saves your memory, besides the addon is executed quite nicely and does not interfere with the visibility although there are some small problems with the interface. If you have a very large screen, some crafting elements may not look right, but it's not so critical and does not affect the game. Pocket interface is convenient because the player must tap just a couple of times to get the item. 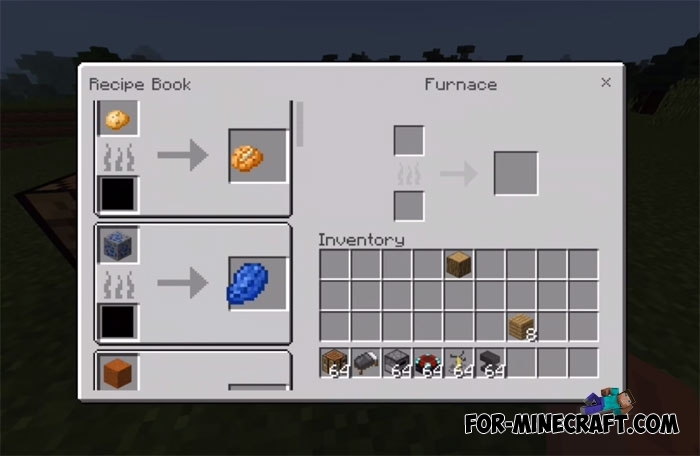 Thanks to the Recipe Book addon, all crafting recipes are on the left side of the screen and are always visible to the players (open crafting table or stove to see). The addon does not contain all the recipes, but it will be fixed in the next updates.